Opposition leader Kizza Besigye with Ms Jacklyn Mbabazi, Amama Mbabazi and Security minister Henry Tumukunde after the funeral of Timothy Mark Rukikaire on Friday. Security minister Henry Tumukunde has praised Opposition leader Kizza Besigye as a powerful man who never abuses his power. In a gesture uncharacteristic of a serving government official, Tumukunde also described the opposition leader as very principled while still in government and never divided people. “There has never been a person in Uganda with power than Col Kizza Besigye. Even when he was still in government, if he summoned you, you would see a young man with power under 30 years. But he never abused his power,” he said. 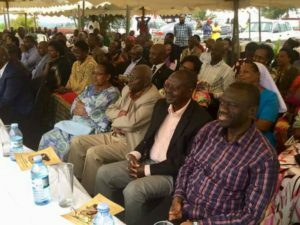 The minister made the remarks on Friday at the burial of Timothy Mark Kainamura, the son of NRM historical and former minister Mathew Rukikaire, in Rwakebengo, Rukungiri District. 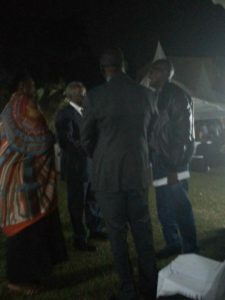 Besigye was also in attendance. Tumukunde added that whereas Besigye has left government, he has remained powerful and influential in the country. “The only person that almost got close was Amama Mbabazi. Besigye is out of government and he still remains a very powerful man. But most importantly he never divided people,” he said. “I got information recently that a group went to consult him about certain things and I was told he informed them that if it’s for development, let’s embrace it,” he added. The minister also urged the four time presidential candidate to reconcile with his political nemesis, President Museveni. “I have known Besigye as a person who never sabotages development. I think that is why we are friends. I hope you can also be friends with your powerful man,” Tumukunde said. He also thanked Besigye for treating him during the Bush War when he was shot in the leg. On his part, Rukikaire also described as a special friend and brother. “This man called Besigye is very special. When my son Timothy died, I knew Besigye was out of the country. I asked Roland Kaginda (Rukungiri Municipality MP) to inform him,” he said. “Besigye cut short his trip in US to come and mourn with us. I was at my home in Makindye and saw Besigye coming for a vigil at 8.30pm,” he added. Col (Rtd) Besigye at the funeral. The former minister also revealed that during the 2016 contested presidential election campaigns when Besigye would be detained at his home, he would go and visit him even when nobody else would be denied access. “I would go to Ruhakana Rugunda’s house and tell him I want to visit my friend Besigye. I would ask Rugunda to call Kale Kayihura so that he can instruct police not to interfere with my visits,” Rukikaire said. Kainamura, 46, succumbed to pneumonia at Gwatiro Hospital in Bweyogerere, Wakiso District, early this week. He suffered brain damage at birth, which had left him immobile. 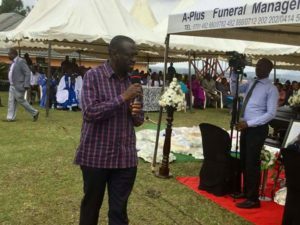 Dr Besigye addresses mourners at the funeral.